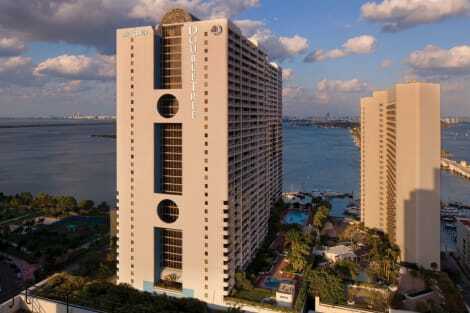 Welcome to the DoubleTree by Hilton Grand Hotel Biscayne Bay in Miami, Florida. Our waterfront condo hotel is perfectly located on Biscayne Bay next to Sea Isle Marina—home to the Miami International Boat Show. Enjoy scenic charter cruises and proximity to downtown Miami and South Beach from our welcoming Biscayne Bay hotel.Stay at our award-winning hotel in Miami, FL and savor a delicious chocolate chip cookie straight from the oven. Make yourself at home in a comfortable guest room or a one- or two-bedroom condominium. Relax during short or long-term stays with all the amenities of home. Enjoy easy access to fantastic dining, shopping and entertainment options downtown and the stunning South Beach, only 3.5 miles away.Our hotel provides an array of dining options, including fresh seafood at Casablanca on the Bay, Chinese cuisine at Tony Chan's Waterclub, authentic Italian dishes at Primo's and the flavorful menu at Los Gauchitos Argentinean Steak House.Host a meeting or event in one of our meeting rooms or celebrate a special occasion in the Grand Ballroom with a terrace overlooking the bay. Work out in the well-equipped fitness center or enjoy a refreshing swim in our outdoor pool. Relax in the whirlpool. After an enjoyable day in Miami or a productive work day in the 24-hour business center, unwind in your guest room or condo. Upgrade for additional space and wonderful bay views at our Miami, FL, hotel. 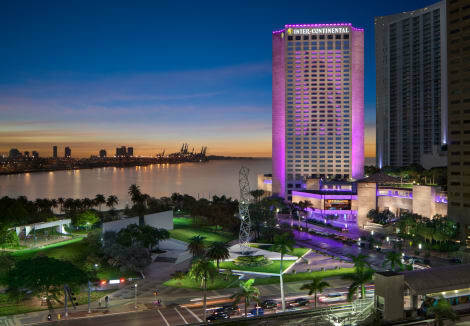 Enjoy panoramic views of Biscayne Bay from the Hilton Miami Downtown hotel. Discover miles of white sandy beaches and South Beach entertainment only minutes away. 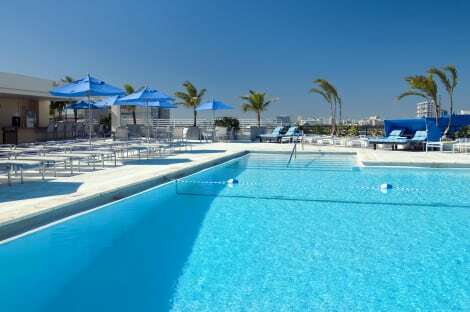 The Hilton Miami Downtown hotel is conveniently located only 15 minutes’ drive from Miami International Airport (MIA) and five minutes from the Port of Miami.Experience all that the downtown Miami performing arts district has to offer including Coconut Grove and the famous Miracle Mile, Miami Beach, Bayside Marketplace, South Beach, and American Airlines Arena.Plunge into the outdoor rooftop pool and admire the Miami skyline view. Enjoy your favorite frozen cocktail or a casual lunch poolside at CityVu Pool Bar. Sample exotic cuisine with an international influence at Brisa Bistro.Hold your next conference or business meeting at the Hilton Miami Downtown hotel in 45, 000 sq. ft. of function space including one of the largest ballrooms (17, 000 sq. ft.) in the Miami area. 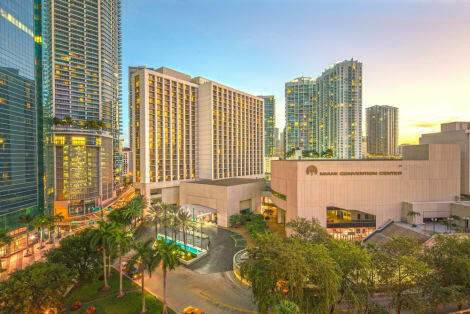 Featuring the latest technology and flexible space, the Hilton Miami Downtown hotel is also ideally located for several major company offices. The hotel's eclectic design brings together a singular blend of styles that, yet different, have been carefully chosen to create one of their own that reflects the hotel's history and influences all over the years. An exhibition dedicated to the energetic and timeless beauty of Miami and its most iconic neighborhoods presides over each floor, making the Eurostars Langford more than a hotel- a window into the life of a fascinating city. The 126 rooms of the hotel feature luxurious spaces, where the comfort of modern facilities merges with an inspiring design. The soft and warm lights, the oak floors with 1920's spike design and the vintage touch of the walls' motifs are complemented by state-of-the-art amenities that are integrated with the rest of the elements as part of the decoration. The wide range of services offered by the Eurostars Langford makes staying at the hotel a unique experience. Its exclusive atmosphere is also in the spacious business rooms, perfect for holding business meetings, as well as in the rooftop bar, a space recalling the glamour and excitement of the Miami of the Prohibition era. These facilities are ideal to enjoy the essence of the city, contained and presented in an accommodation that outlines a new, glamorous type of hotel. For lunch or dinner, stop by Riverwalk Cafe, a restaurant that specializes in regional cuisine. Dining is also available at the coffee shop/café, and room service (during limited hours) is provided. Wrap up your day with a drink at the bar/lounge. Buffet breakfasts are available daily from 6:30 AM to 11 AM for a fee. Make yourself at home in one of the 352 air-conditioned rooms featuring tablet computers and flat-screen televisions. Rooms have private furnished balconies. Wired and wireless Internet access is complimentary, while iPod docking stations and cable programming provide entertainment. Private bathrooms with showers feature rainfall showerheads and designer toiletries.